I was sent the Manuscript Calligraphy Pen from Cult Pens after an opportunity to review went out on Twitter, I was lucky enough to be one of the recipients. Manuscript was not a brand I was familiar with. In order to understand a bit more about the pen I was reviewig I had a quick look online. Manuscript are a British company who have been producing pens for five generations. They produce a range of calligraphy and paper products. You can find out some more about them here. Their website is informative and well presented. Perhaps moreso than the actual Manuscript Calligraphy pen. The Manuscript Calligraphy pen was my first experience with a calligraphy fountain pen. 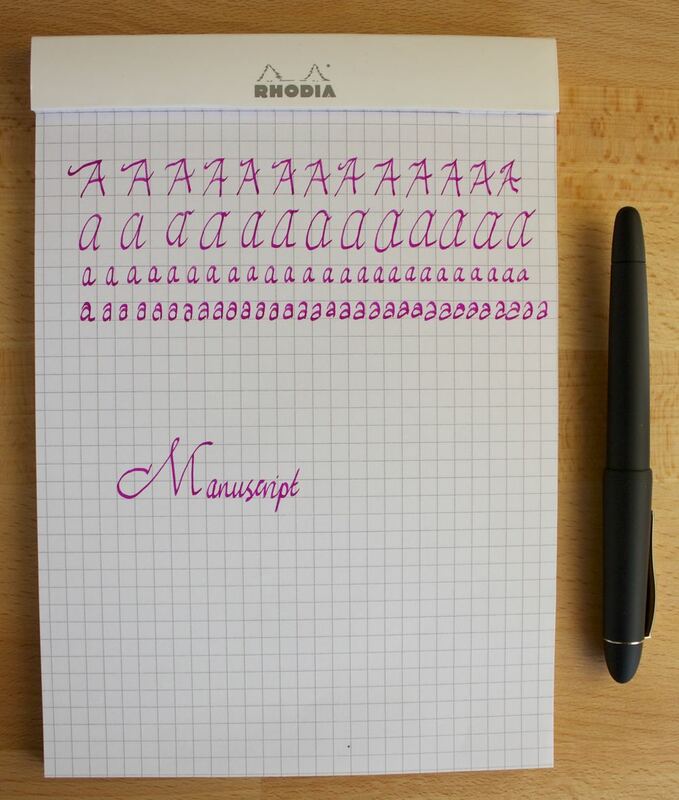 I am definitely not an expert when it comes to calligraphy products however the Manuscript pen has peaked my interest. Price is a big bonus, a mere £15, which throws this pen right into the affordable price bracket. Because of this it becomes less of a considered purchase and is a low risk factor. The Manuscript pen takes standard ink cartridges and there is an optional Manuscript converter. 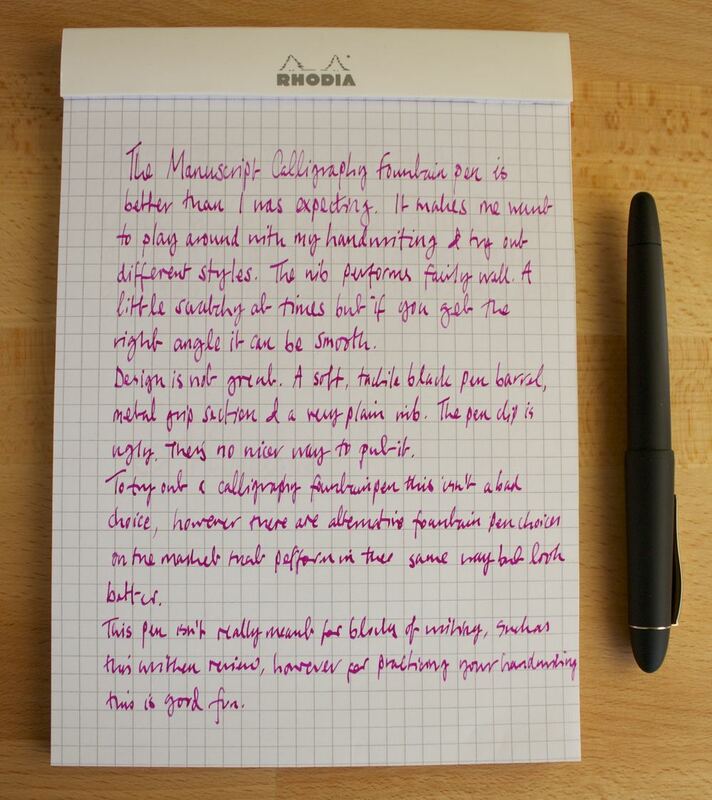 For the purpose of this review I used Diamine Claret ink cartridges which worked perfectly. The nib on the Manuscript pen is a 1.1mm medium italic. I played around with the pen quite a bit to see how the nib performed using trusty Rhodia paper and attempted to produce some fancy handwriting. I have included photos of my poor calligraphy efforts to show how the pen performs. At times the nib was a bit scratchy, particularly when used at certain angles but on the whole I found the experience satisfying. Between the grip section and the nib there is a small ink window which circles the entire pen. This is quite a nice feature and is useful to monitor ink levels. From my set up you get a lovely view of the deep Claret ink colour. Not too bad for a low cost calligraphy pen. A small bit of attention to detail that goes a long way. One final nice addition is the tin packaging that the Manuscript pen comes in. This is a bit of an exception for a low cost pen and it's quite nice. The Manuscript pen has a strange tactile, soft touch feel. It's odd. It's not offensive but at the same time I don't like it. A smooth barrel would be a better choice in my opinion. Hand in hand with this, and a bit of a contrast to the barrel, is a chrome grip section. This again is strange. The Manuscript pen is £15, so a simple plastic grip section would have been fine, and probably felt a bit nicer. But instead you get this metal grip section that unevenly distributes the weight of the pen in favour if the nib and doesn't feel very nice in your hand. On top of this the design of the pen is old fashioned and dull. The pen has a black barrel similar in length to the Pilot MR but a bit fatter. The pen has a chunky chrome clip with an odd wave in it. The clip finishes short of the cap itself to display the Manuscript 'M' logo underneath. The odd design surprises me slightly based on the impression you get from the Manuscript website. It almost feels like this part was forgotten or rushed. Very poor marks on this point for me and the design of a fountain pen is half the fun. This is not a fountain pen that you would use day in day out, and not something you are likely to choose to carry to work or travel with. More than likely this is a pen to play around with at home and practice some calligraphy writing. And for this purpose I can't find a reason why you shouldn't try this pen out. 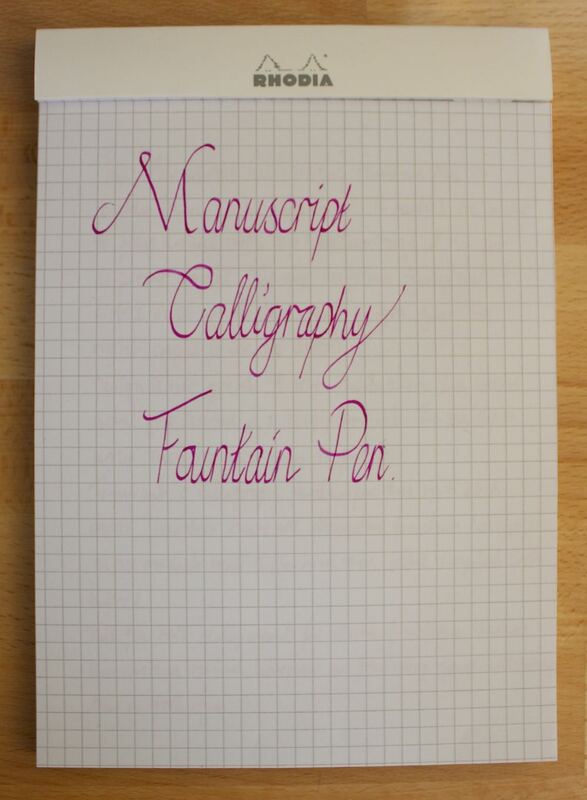 The affordable price works in the Manuscript Calligraphy pens favour. My verdict on the Manuscript is simply give it a try! There are flaws but they aren't enough of a barrier to cast aside this pen. I would like to thank Cult Pens for sending me this product to review.